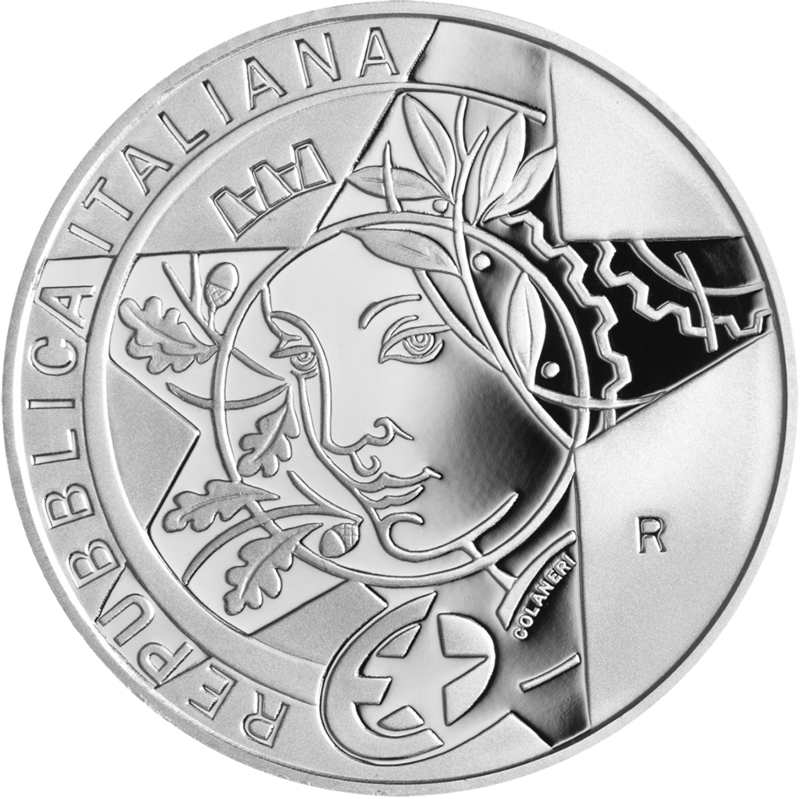 The Istituto Poligrafico Zecca della Stato, or IPZS, have issued (15th May) their latest collector coin in part of the multinational Europa Star series, which focuses this year on the “Ages of Europe—Iron and Glass.” The Europa Star coin program is an ongoing annual numismatic initiative begun in 2004. 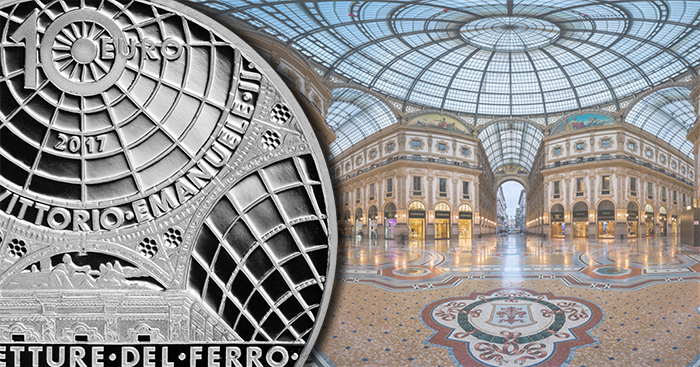 The featured structure on the Italian entry in the series is that of the Galleria Victor Emanuele II, located in Milan. Often referred to as il salotto di Milano, or Milan’s drawing room, due to its numerous shops and its importance as a common Milanese meeting and dining place, the structure was a success almost from the day of its opening. Cast-iron architecture flourished in Europe between the end of the 19th century and the beginning of the 20th, especially in France, England, and Italy. The most representative building of this style is the Galleria Vittorio Emanuele II in Milan. The building, designed in neo-Renaissance style by architect Giuseppe Mengoni (1829–1877), strikes a perfect balance between the modern cast-iron-and-glass roof and the precious, refined decorations. This spectacular structure is not only one of world’s oldest shopping malls or plazas still in continued use, it was in its earlier history, one of the largest covered commercial markets. Named for the first crowned head of state of a united Italian kingdom—Victor Emanuele II, who reigned from 1861 until his death in 1878—the building underwent construction between 1865 and 1877. Sadly, the brilliant architect did not live to participate in the inauguration of the galleria’s opening, which was held on the 30th December 1877, as he died from a fall off a scaffolding the day before its official opening. The imposing four-storied structure consists of two glass-vaulted arcades that come together in a central octagon covering the street and is topped with an exquisite glass dome. The primary walkway connects the Piazza del Duomo to the Piazza della Scala, another famed structure in Milan. As part of the internal design, the flooring consists of four mosaics that depict the crests of the cities of Rome, Turin, Florence, and Milan, the first three cities once serving as a capital of the new kingdom at some time in history. The common obverse design for the second Europa series is the work of artisans from the Monnaie de Paris and features a large, off-centre star in the background. In the case of Italy’s example, designer Maria Carmela Colaneri has styled an allegorical representation of Italy with details from the emblem of the Italian Republic: within the five-pointed star, a cogwheel and branches of oak and olive; and above the star, between two points, a towered crown. At the base of the star are the logo of the Europa Star Programme and the name of the designer, COLANERI. To the right of the base is the letter R, identifying the Mint in Rome. The primary design is surrounded by the text REPUBBLICA ITALIANA. 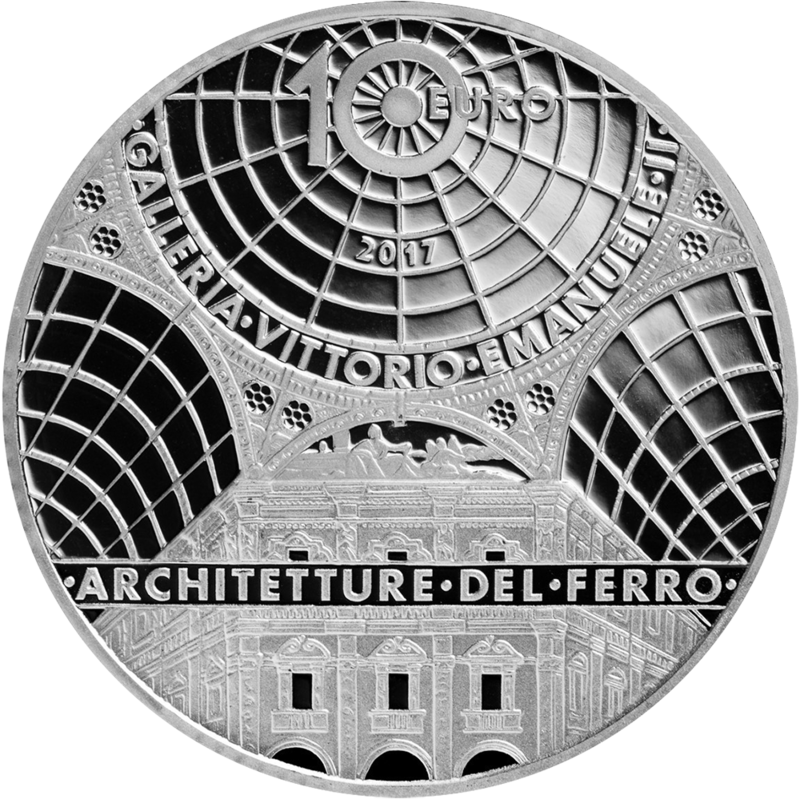 The reverse depicts a view of the Galleria Vittorio Emanuele II that focuses on the cast-iron dome. Above, the value 10 EURO is integrated into the roof’s design, along with the year of the coin’s issue, 2017. The arch-shaped inscription ● GALLERIA ● VITTORIO ● EMANUELE ● II ● is placed around the lower edge of the dome, and the inscription ● ARCHITETTURE ● DEL ● FERRO ● is placed across the primary design. The coin is available in Proof quality and directly from the IPZS by visiting them their e-webshop. Many past Europa Star coins from different countries are available on the website of Coin Update sponsor APMEX.